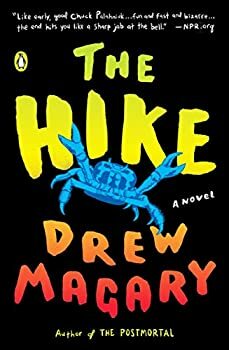 I’m of two minds on Drew Magary’s The Hike (2016). On the one hand, it’s a fast, energetic, often funny and sometimes moving work. On the other hand, its plotting feels wholly capricious and arbitrary and some of the territory it wanders is well-worn or less profound than it seems like it wants to be taken. I mostly like my books with a bit more structured depth, and if you do as well, then I think you’ll zip through and enjoy The Hike while also being a bit annoyed. But if you’re looking for is a fun video game kind of ride with a smattering of emotionality, you’ll just enjoy. Magary begins pretty mundanely, with the main character Ben on a business trip in a mountaintop motel in Pennsylvania. He sets off on a trail behind the motel, and then things turn grimly dark as he witnesses a horrific event that leads to a horror-movie type of chase scene. Soon the “path” he was on has become “The Path,” a magically marked road in a frighteningly surreal world. If he wishes to get home, Ben has to make his way to the end of the Path and find The Producer, overcoming a series of obstacles both living and not (puzzles, giants, dog-faced monsters) with only the help of a talking crab he picks up on the way. The episodic nature is one of the reasons the books drives forward so quickly and easily, as there is not much connecting tissue between events (nor does Magary spend much time on description). That’s the upside of the video game/dungeon crawl aspect of The Hike. The downside is that it all feels a bit arbitrary and disconnected. No need for cause and effect; it’s just surreal. No need for any real importance to a particular puzzle; it just needs to be solved. This issue nagged at me throughout, but one’s mileage will vary on this; some may not notice it at all or just shrug and go along for the ride. And to be fair, the author does offer up an explanation towards the end of why some of Ben’s encounters took the form they did. And of course, if the Path is a metaphor for life, well, life itself can be more than a little surreal or random or lacking in meaning. That last aspect is the other small niggling issue that prevented The Hike from moving from a pretty good read to a very good or excellent one. Life as a road is a well-trod, um, path in terms of metaphors, and not a particularly deep one. And I can’t say anything new is added to the extended metaphor in this story (persistence, adversity, etc., etc.). It’s not a bad metaphor, and Magary makes inventive use of it, but the metaphor and the randomness makes it all feel a little too easy. My last complaint was that at times Ben didn’t react/act as I’d think a person might in particular situations. Again, one’s mileage may vary on this one. I did enjoy The Hike; it went down easily and quickly and made me laugh more than a few times. It’s not a great book, but it’s a good read and one I’d recommend for when you’re in the mood for that sort of thing. Published in 2016. From the author of The Postmortal, a fantasy saga unlike any you’ve read before, weaving elements of folk tales and video games into a riveting, unforgettable adventure of what a man will endure to return to his family. When Ben, a suburban family man, takes a business trip to rural Pennsylvania, he decides to spend the afternoon before his dinner meeting on a short hike. Once he sets out into the woods behind his hotel, he quickly comes to realize that the path he has chosen cannot be given up easily. With no choice but to move forward, Ben finds himself falling deeper and deeper into a world of man-eating giants, bizarre demons, and colossal insects. On a quest of epic, life-or-death proportions, Ben finds help comes in some of the most unexpected forms, including a profane crustacean and a variety of magical objects, tools, and potions. Desperate to return to his family, Ben is determined to track down the “Producer,” the creator of the world in which he is being held hostage and the only one who can free him from the path. At once bitingly funny and emotionally absorbing, Magary’s novel is a remarkably unique addition to the contemporary fantasy genre, one that draws as easily from the world of classic folk tales as it does from video games. In The Hike, Magary takes readers on a daring odyssey away from our day-to-day grind and transports them into an enthralling world propelled by heart, imagination, and survival. This does sound fun, though. While _The Hike_ is fantasy, it’s not genre fantasy and ought not to be read that way. It’s more a work of surrealism than anything else. That is, it doesn’t take place in a realistic setting where the rules are different (“magic works”) – it takes place in a dream world where rules are arbitrary and shifting when they exist at all. Read in that spirit, it’s a pretty good book. That’s exactly right–if you like or simply don’t mine the surreal/arbitrary, you’ll almost certainly enjoy this. If you’re the type who finds it grating, then it’ll depend on how much the fun balances the annoyance (I still think the book wins out even for non-fans of surrealism). But as you note, expectations going in can make a big difference.